Junior Johnson is a former NASCAR driver of the 1950s and 1960s. He won 50 NASCAR races in his career before retiring in 1966. In the 1970s and 1980s, he became a NASCAR racing team owner; he sponsored such NASCAR champions as Cale Yarborough and Darrell Waltrip. 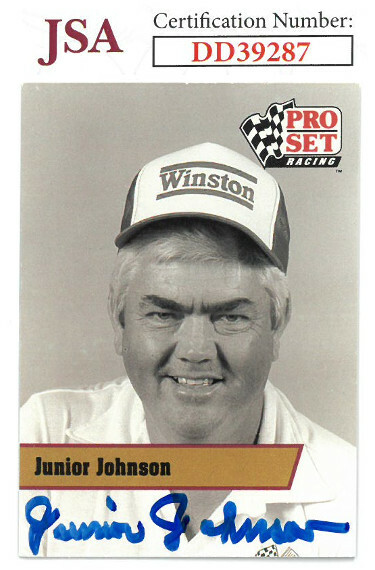 Junior Johnson has hand signed this 1991 Pro Set Racing Trading Card #L17. JSA Hologram #DD39287 and Certificate of Authenticity.